Among the bosses in the hall ceiling at the manor is a gold shield with three black stripes tapering down to points that meet at the base of the shield. This is part of the arms of the Cade family who lived at Halsway for five generations. 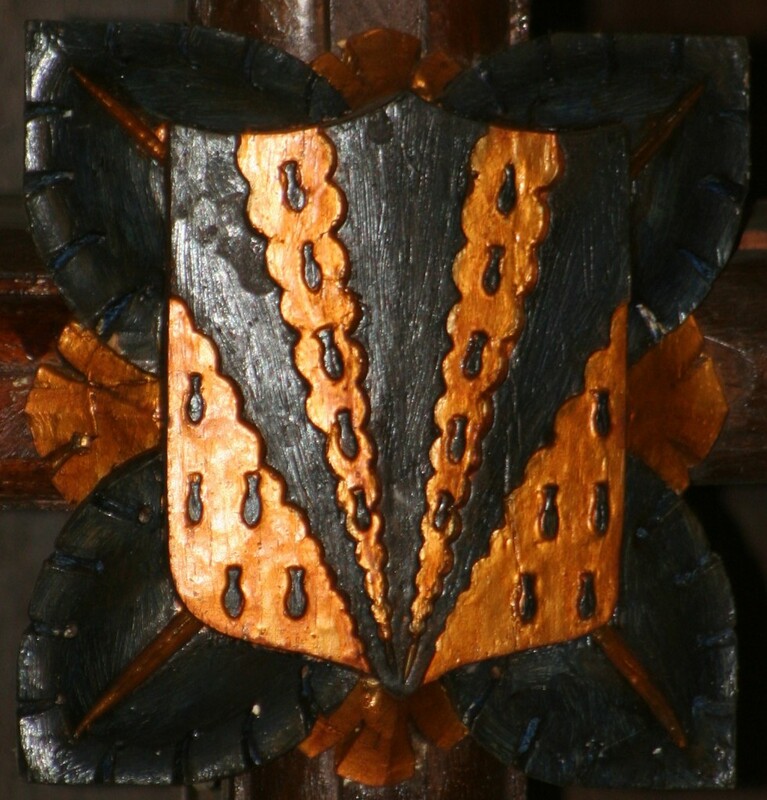 A similar device described as “Argent, three piles in point, wavey, sable,” is recorded in the Visitations of the County of Devon as the arms of the Cades of Fremington in Devon. (That the shield at Halsway is gold rather than silver is probably due to a decorator’s whim). The Cades were an old Devonshire family with a pedigree going back to the family of William the Conqueror. William’s cause was strongly supported by his father-in-law, Earl Baldwin, Count of Flanders and, in reward, the Earl was created Sheriff of Devon. A younger daughter of the Earl married a John Cahido or Cade in 1084. On Earl Baldwin’s death, John, through his wife, became owner of the manor of Dunsland in North Devon. In 1637, a James Cade, a descendant of the Devonshire Cades, purchased Halsway Manor from Elizabeth Stradling. There is a reference to a James Cade of Stogumber among the sets of Devonshire wills lodged at the Exeter Probate office. Four James Cades in succession owned the manor. The first James was mentioned in the Wilton Register when he was threatened with imprisonment for refusing to accept the office of Constable of the West division of the Wilton Hundred. He died in 1640. The second James died on January 10th, 1655 and is buried in Stogumber Church. The succeeding James died in 1702 and in 1733 his son, the fourth James, sold part of the manor estate to Richard Hembrow of Bicknoller. When, on his death in 1741, the estate passed to his eldest son Charles most of the property had been sold or was heavily mortgaged. Charles, who had been a churchwarden at Stogumber in 1743, resumed this appointment from 1763 to 1767 and again in the year of his death in 1775. He is buried in the Halsway aisle of Stogumber Church. There is a bell in the church bearing the inscription “Cade 1775.” Also in 1775, Charles was recorded as a Trustee of the Minehead Turnpike. The estate passed to his brother Nathaniel, James’ youngest son, who was a joiner in Bristol. He sold the manor to one of the main creditors, William Snow of Porlock. Over the years since the purchase from the Stradlings the estate had run down considerably and what was once the house and estate of a wealthy knight had become a farmhouse with a much reduced acreage and let to a succession of tenants. In 1817, when the estate was sold to Mary Stoate of Porlock, the tenant was a James Crang. She continued the lease and subsequently bequeathed it to him.